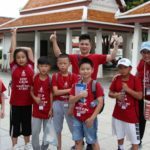 Wednesday was the first trip of Bromsgrove’s 2018 Summer Camp. 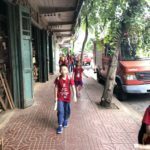 The students played and competed in a Treasure Hunt activity in Bangkok’s Old Town. 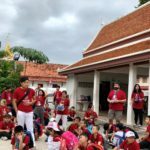 This activity was organized by an adventure company called GoSnoop, and it allowed students to think outside of the box, build character, and experience Thai culture in a historic district. 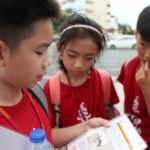 The kids were separated into groups and worked as teams to achieve their mission, finding the missing family. The kids followed the guidelines and searched for clues at different locations. 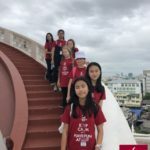 On the way, the students did not only experience traditional Thai culture, but they also visited famous Thai landmarks such as Golden Mountain temple. After the journey, the students had lunch at a hotel in the Old Town. At night, some students watched a movie in Tudor House. All of them enjoyed the first trip of their summer camp! 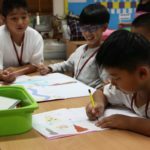 Today, students wrote diaries about their fun experiences and impressions from their Treasure Hunt trip. Another class drew transportation comics from their based on memories of their trip to the city. 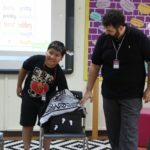 Please enjoy the photos of our daily activities. We hope you enjoy seeing these memories in real time. 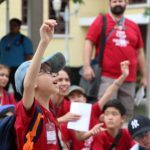 In addition, after our summer camp concludes, these photos and many more will be available on our school’s website for you viewing pleasure.